Since station close, the weather down here has been terrible. Actually, for a normal person, quite pleasant, but from an experimental cosmologist's standpoint, terrible. It's been completely overcast for days, with only brief glimpses of clear sky, and several times now has actually snowed - not just ice crystals condensing from the atmosphere, but full-on snow. It's not supposed to snow at the South Pole, and the veteran polies are fairly confused by the strange weather. 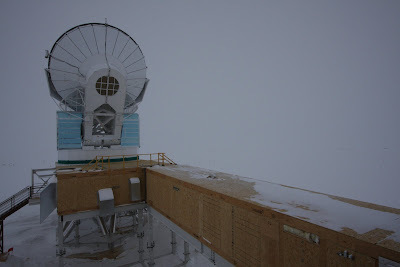 Today the temperature flopped several times between -32C and -43C; normally a 2 degree change is considered extreme. The winds have also been picking up, and coupled with the snow, often make seeing anything at all quite difficult. The ground is entirely made of snow, and when light becomes so diffuse, all contrast from shadows is lost. The world takes on a uniform (and I mean completely uniform) shade of grayish white. Your eyes struggle to find something to focus on, but can't. Structures are still visible in the distance, but the ground, horizon and sky all blend into one single white void. I really have to emphasize how little contrast there is. You honestly can't distinguish the ground under your feet from the sky, except by direction. It's like having your eyes closed, except they're wide open, and your brain is still struggling to identify something - anything - in your surroundings. You exist in a field of completely uniform color, without any sense of where or what anything is. Buildings appear to be floating in a mist of nothingness. It's tremendously disorienting, surreal, and, like everything else down here, surprisingly beautiful. All in all, the weather's been fascinating since station close, but completely useless for observations. I guess we'll have lots of good weather later in the season, so I might as well enjoy the strangeness while it lasts. i do know what you mean, i think - it sounds like scuba diving in bad visibility (except that then you really are floating in it). You keep calling whatever hellscape you encounter "interesting" or "beautiful." When are you going to crack, you enormously mentally well boy?